Okay, I KNOW this sounds weird...but it's not half bad. Makes Approx 15 servings (a little more than what is needed to frost a 8x12 cake). Whisk soy sauce, vinegar, honey and ginger in a medium bowl until the honey is dissolved. Preheat broiler. Line a baking pan with foil and coat with cooking spray. Transfer the salmon to the pan, skinned-side down. Baste with the marinade. 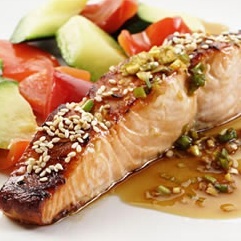 Broil the salmon 4 to 6 inches from the heat source until cooked through, 8 to 12 minutes, or until salmon is not longer dark pink in the middle.
. Drizzle with the reserved sauce and garnish with sesame seeds (if using). Preheat broiler to high, and position oven rack 4 inches from heat. Sprinkle garlic salt on salmon, then basil. Add sliced tomatoes and add salt and pepper. Mist with cooking spray. Broil on high for 10-12 minutes or until salmon is no longer dark pink in the middle. I did something a little different since I have had trouble getting yeast to function for me in the past. (Could be user error, but I just can never make it work! Grr. Tips welcomed in the comments!) I made this with my Vitamix blender. My Vitamix came with a recipe book, and it had recipes for whole wheat breads/crusts. 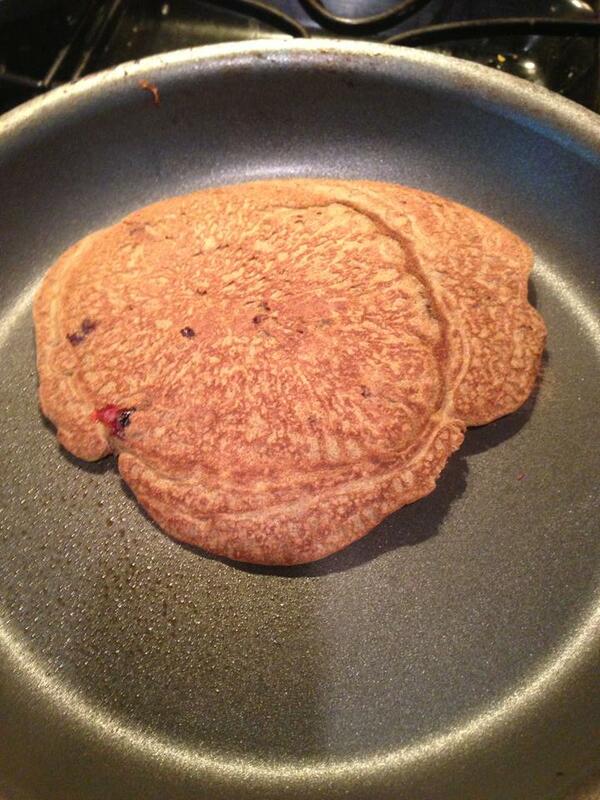 SO I took the clean-eating ingredients, and applied the Vitamix cooking method, and the result was pretty tasty! Hubby and son approved! Place the yeast in the warm water (100-110 degrees) and let stand for 5 minutes. It should foam. Spray a cookie sheet or pizza pan with cooking spray. Place all dry ingredients in the Vitamix and turn on medium until it is mixed and there is a well in the center. Pour the honey and yeast water in the center. Turn the Vitamix on high for 1 second at a time (manually pulsing it) 5 times. Pause and scrape down the sides (I had to kinda "knead" it all together with my rubber scraper), and repeat until mixture is a rubbery dough. Pulse one last time to raise the dough away from the blades as much as possible. Now (this is the tricky part), turn the Vitamix upside down over the cookie sheet, and manually rotate the blade using the knob on the bottom of the blender to free the mixture from the blade. This did not completely free the dough for me, so I had to use a spoon to scrap the rest of it out. I still had some I could not free from the blades. Now, ideally here, you would spread the dough onto the pan. My dough stuck to the spoon, so I had to constantly wet the spoon to spread the mixture out with the back of the spoon. I tried floured hands, a floured rolling pin (disaster), and finally went with the wet spoon. Again, tips here would be welcomed in comments! Once the dough is spread, cook for 350 for 15 minutes or so until the dough is nice a brown. Remove from the oven and either wrap in foil/saran wrap and freeze it until ready to use, or put the pizza toppings on immediately. When ready to cook, heat the oven to 450. Top with desired ingredients. I used 3/4 cup tomato sauce (one small can) seasoned with basil, garlic, and oregano, turkey pepperoni (28 slices) and 4 slices of 2% mozzarella cheese. (See tip below). Cook for 7-10 minutes until cheese is melty and crust is crisp. Watch it, it will burn easily since the crust is pre-cooked. Tip: Dont' have shredded mozzarella? Place sliced, string, or block cheese in a Magic Bullet (or blender would work) and "blend" until it is all grated up. Works WONDERFULLY for pizzas. A "clean" recipe. Jeremy wasn't a huge fan. I thought they were ok.
1 1/2 teaspoons garam masala, OR make your own with: cumin, black pepper, cinnamon, nutmeg, salt and ginger (to taste). Preheat indoor/Foreman grill to medium-high or position rack in upper third of oven and preheat broiler. Sprinkle chicken with garam masala. Cook chicken until no longer pick: 4 to 8 minutes per side, depending on the size.. Transfer the chicken to a clean cutting board and let rest for 5 minutes. Meanwhile, combine broccoli slaw, yogurt, cilantr, lemon juice, a little more garam masala and 1/4 teaspoon salt and pepper in a small bowl. Thinly slice the chicken, and split open the warm pitas and fill with the chicken, yogurt mixture, and lettuce (if using). Wisk together the dry ingredients first, then add wet ingredients and stir until lumpy. Stir in blueberries. I serve with sugar free maple syrup! Add whatever you like. Tip: Try adding dark chocolate chips for a sweet treat, and it's still "clean".